In 2018 over 800 people signed up to receive the Grizzly Analytics Guide to Indoor Location Technology. In 2019 we are on the way to having over 1000 sign-ups. 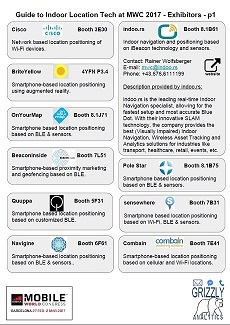 These recipients are specifically interested in indoor location, and our Guide brings those interested people directly to your booth. 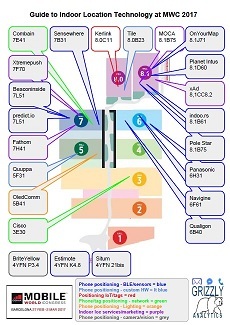 Basic listings are available for all indoor location related exhibitors for free. Basic listings include your location on the map, color coded by categories, and a profile that gives your name, logo, booth location and a sentence describing your technology or solution. Expanded listings are available at a low price of $499. Expanded listings include the name, phone number and e-mail address of your representative, and a paragraph that you can write describing your company in detail. 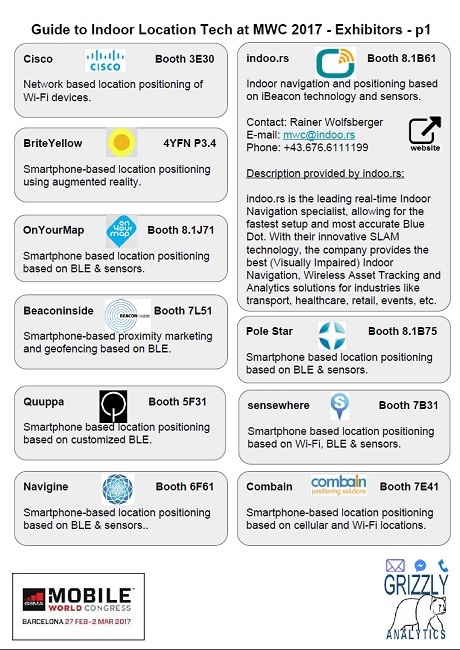 Sign up now to claim your entry in the Grizzly Analytics Guide to Indoor Location Tech at MWC 2019! Be sure to confirm your sign-up in the e-mail you'll receive. Want to receive the Guide? Click here. © 2018 Grizzly Analytics LLC.